This is a commission slot. You can hire Piyu to create a personalized artwork of this sort here. The artist will most likely respond to a request within 4.5 days. This commission slot was rated positively by 33 clients thus far. Colored half body in anime/manga style, of any character you want. I add a simple background for free (color with texture and some basic details, or I can draw a more complex background for $5. If you want more than 1 character in the picture it would be + $8 per additional character up to 3 chacaters. If its 4 characters in the same picture it will be + $10 per additional character intead of 8. 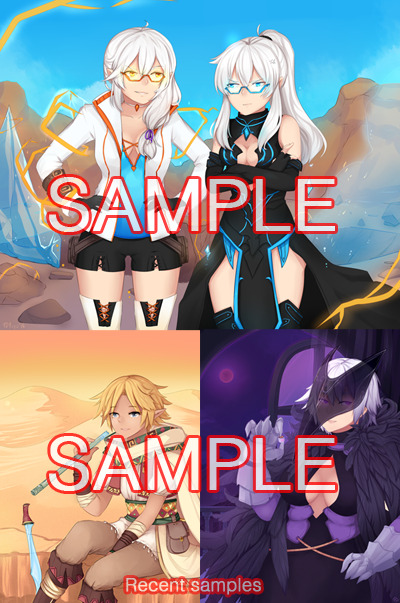 You can get fanart of any series, or your original characters. References are greatly appreciated. Also a description of the pose, personality and details for the background would be awesome! The artist is very sweet and very down to earth. They were welcoming and was very thorough in their quick and a m a z i n g work! I will be recommending them to everyone that's looking for art - and I will be coming back myself! Beautiful work and kind hearted. ? Incredible all around! Frequent updates, incredible flexibility about each part, as well as adding things not typically on the sheet. And not to mention the just incredible art, I'll be back for more soon enough that's for sure! All around great person and artist. Piyu is very patient person to work with. Willing to sit through multiple revisions and try out new ideas. She helped me realize where my character needed to be and I'm deeply grateful for the final result. Piyu is not only an an amazing artist. They are also very polite and easy to work with! I had a lot of commissions done by Piyu as I loved the art and the price! Top quality service too, Piyu took the time to make sure everything I wanted was done correctly and to a point I was happy with it. Piyu even went the extra length to send multiple revisions and final versions to make sure I was happy with everything. Can not recommend this artist enough. The artist put in so much time and effort to make sure that it came out perfectly, I definitely recommend hiring him for any art you need. Awesome as usual! Piyu is by far one of the best artists I get to work and talk with. Amazing work, Super happy with my commissions and the artist was very communicative throughout the whole thing! Going to commission more! Had a really good time working with Piyu, amazing artist who took the time to make sure everything was correct and constantly updated me with every step. Very communicative and friendly. Highly recommend! Amazing artist <3 I can't believed i had the chance to commission my mascot <3 Very polite and great to work with. Results are better than briefed. Gave her the details for a custom job and she delivered. 10/10 going to come back for more. Absolutely amazing, and a pleasure to work with. 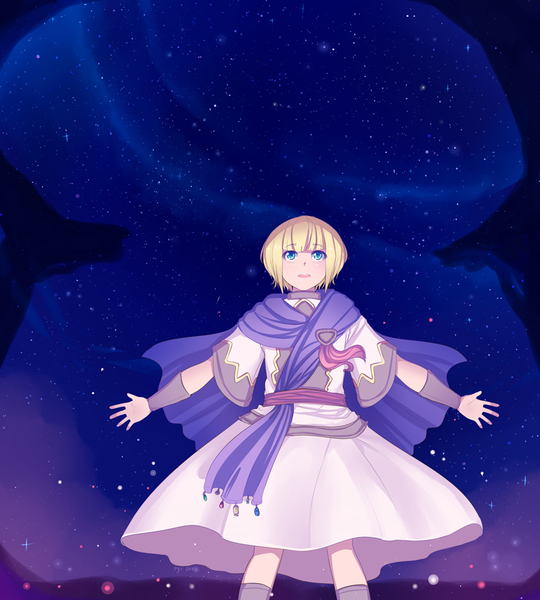 Piyu is a fantastic artist and it's a pleasure to work with them ! Once again, one awesome piece of work! Piyu is by far one of my most recommended artist to go to for any piece of work! Throughout the entire process of all of this, I was amazed with every bit of work Piyu put into the project. Very satisfied! Great work \o/ I'm not the best with words, but Piyu is an amazing artist, and quite friendly and willing to communicate well! She's so quick, professional and very friendly! ? the process was very nice and ejoyable~ I fell in love with the finished piece aksjdkals -faints- Thank youuu???? It was a pleasure working with piyu, amazing work and timely results! I will always recommend coming to them for a commission! Piyu does amazingly well-done and thorough art and is great at communicating and understanding what you want, all for a price that can't be beat. Highly recommended! Super quick, and eager to listen to what was wanted. I love the piece I ended up with, and will absolutely be commissioning again in the future! Helpful, friendly, and ready to assist you in anyway. I'd personally commission again! Wonderful artist! Very polite, great customer service, and completed my request in a timely fashion. I look forward to working with her again! ? Extremely responsive and accommodating to changes. AWESOME FINISHED PRODUCT. Would commission again. Hi! To start with the process please, reserve the slot here. When you place your order, you can leave me messages there with all the details. 1st I make a sketch with basic shapes and expressions and send it to you. We can change or add anything you want in this stage! 3rd I send the final picture in its original size. 4th Once I finish your order, I’ll send you the picture with the original size using this site's watermak. I'll upload your image with watermark, and when you are satsisfied with the work and pay+mark the work as complete the watermark will automatically dissappear! I might use the finished comission as an example of my works here in A&C. If you would prefer not to show it, please tell me. You can't resell the commission, but you can use it in any other way. Be it for your game, for roleplaying, for printing it in a shirt... just dont resell it, please. 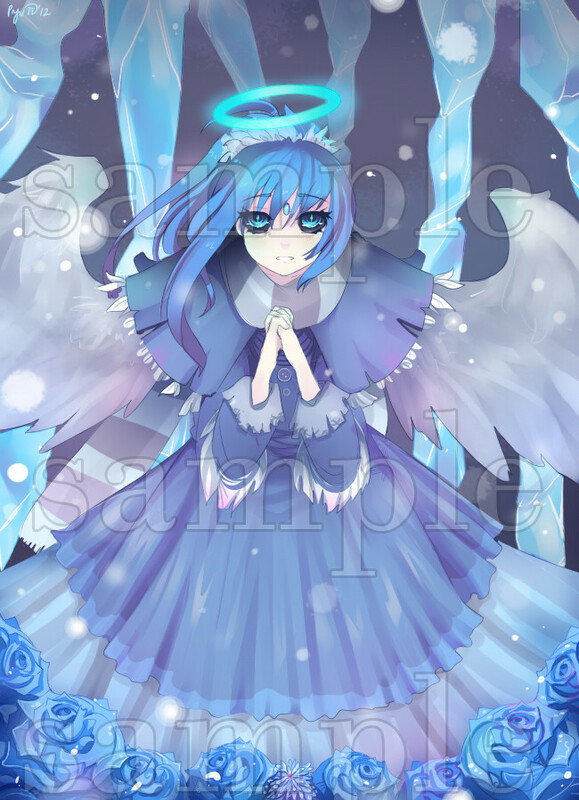 I would love to be given credits for my work with a link to this site, or my Deviantart. Sometimes I add my signature in the reference sheets and half bodies, please, dont remove it. Q: How much time will it take? : A: It depends on the type of commission and how much free time I have. I do comishes on my free time from studying/part time work to save up for paying my courses. I try to reply and deliver some progress shots as soon as possible (in less than a week usually). Feel free to send me messages to check my current workload and/or work times! Q: Is the character sheet slot open? I see it always taken or closed! : A: Unless it says in red "CLOSED" its probably taken by another customer. Its a popular slot and sometimes I have a waiting line, but its open. Send me a private message to check when will it be open more or less! I always try to send a message to all of you who are waiting to give everyone the same chances to get it! Its first come, first serve.